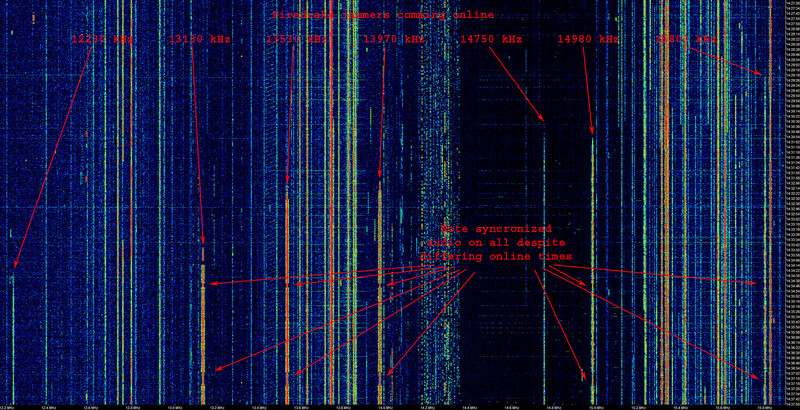 I barely heard 13920 around 12:30Z this morning. Checked on Wed & Thrs around the same time and didn't hear them on 13920. Also was checking 13970, 13820 & 13870. Couldn't do a lot of searching as was driving. Linked are a couple of images of typical Firedrake starts on different dates, the second is this morning (March 30, 2013), there is a time scale on the right side of each image. Each image has multiple Firdrakess coming online. The two images are pretty big, around 3 MB each, so I am only linking them, not embedding them. If you zoom in you can see some detail of each. Thanks Token, those are great images, especially the one from today which I also logged and compared to yours. You heard a couple that I didn't. Have noticed the audio being synchronized (when listening on multiple receivers), but never was able to catch them as they started. Also reinforces the point to keep searching even after several have come on. What did you use to record that wide of a spectrum? There may have been more Firedrakes on, I frankly only grabbed the obvious ones just to make a quick image. I have seen up to 16 up at one time, and have been told they can do over 20. That shot is from the wideband display on the Excalibur Pro (Excalibur has the same display). The full image was 30 MHz wide, 0 to 30 MHz (it can also do 0 to 50 MHz width if desired), but I just trimmed out the segment I wanted after the fact.